There are natural processes that generate thin layers of oily surfactant, so this does not necessarily show that oil from the spill is moving into the Straits yet. 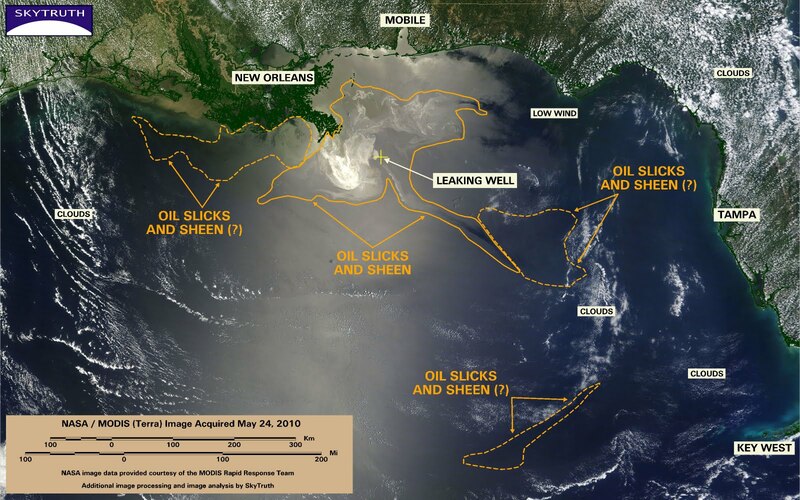 But the spill has clearly been interacting with the Loop current since May 17, and at a speed of 1 to 2 knots (see below), ten days is enough time for some of that oil to have moved 240 to 480 nautical miles (276-552 miles). 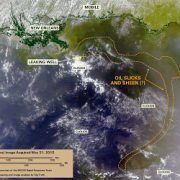 Although it’s 510 miles as the crow flies from the leaking well site to Florida Straits, the convoluted path taken by the Loop Current adds up to a total distance of about 900 miles, so we may not be there yet. Consider this a possibility, not a definitive conclusion. 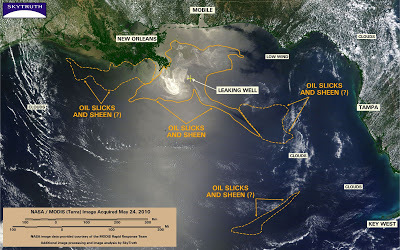 Systematic water sampling in the eastern Gulf sure would be helpful to pin this down – is anyone doing that? Sea-Surface Velocity (SSV) map derived from satellite radar altimeter data, May 27, 2010. Location of the Loop Current is indicated by green to red band of relatively high velocity at the ocean surface. Source: Colorado Center for Astrodynamics Research. 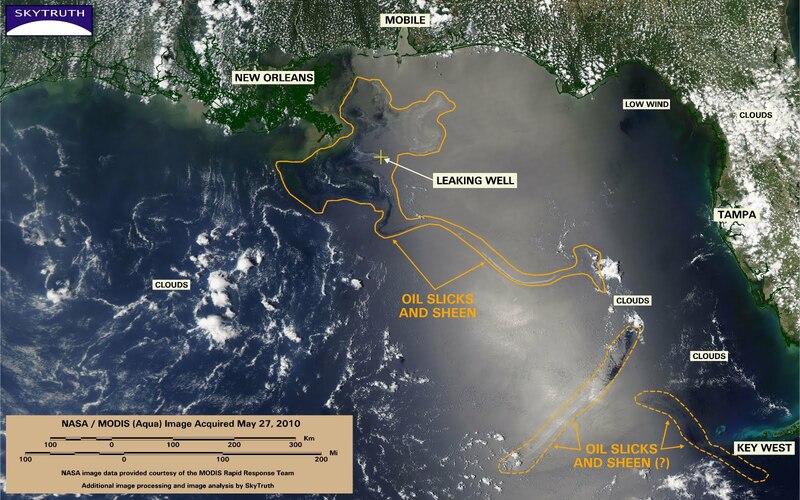 BP is currently trying out the “top kill” procedure to plug the leaking well. The success of this attempt is still uncertain, but at least the blowout preventer appears to be hanging together under the increased strain. Live video feed shows what appears to be a strong plume of oil and drilling mud coming from one of the leaks in the busted-up riser pipe. Keep your fingers crossed – this really needs to work. It’s Day 35 of this fatal incident. 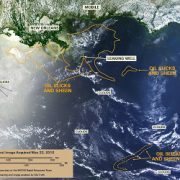 Our estimated spill rate of 1.1 million gallons (26,500 barrels) per day, now on the conservative end of the scientific estimates, leads us to conclude that almost 39 million gallons of oil have spilled into the Gulf so far. 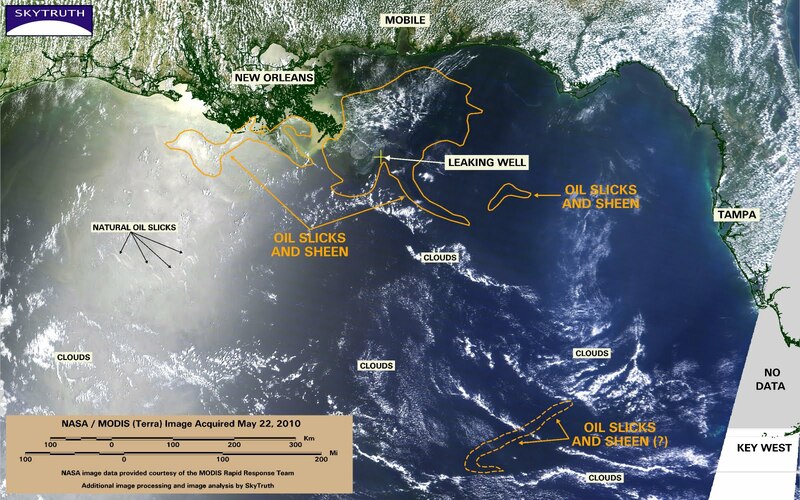 BP and the federal government had said that they would announce a new official estimate of the daily spill rate on May 22, but we’ve heard nothing more about that. 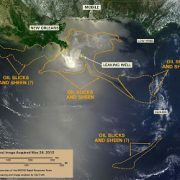 As far as we can tell, they are still claiming the spill rate is 210,000 gallons (5,000 barrels) per day. 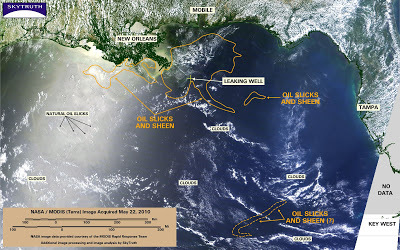 At that much lower rate, the total amount spilled would be 7.35 million gallons. 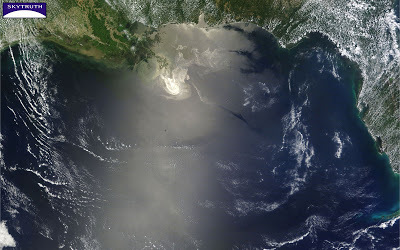 MODIS / Terra satellite image, May 22, 2010. 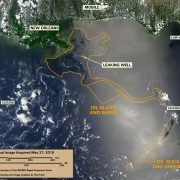 Clouds and haze obscure the southeastern Gulf, but a small patch of what might be oil entrained in the Loop Current is visible. As we’ve said before, it is possible the Loop Current has a distinct color even without the presence of oil, so this is a low-confidence analysis and therefore is shown with a dashed orange line. 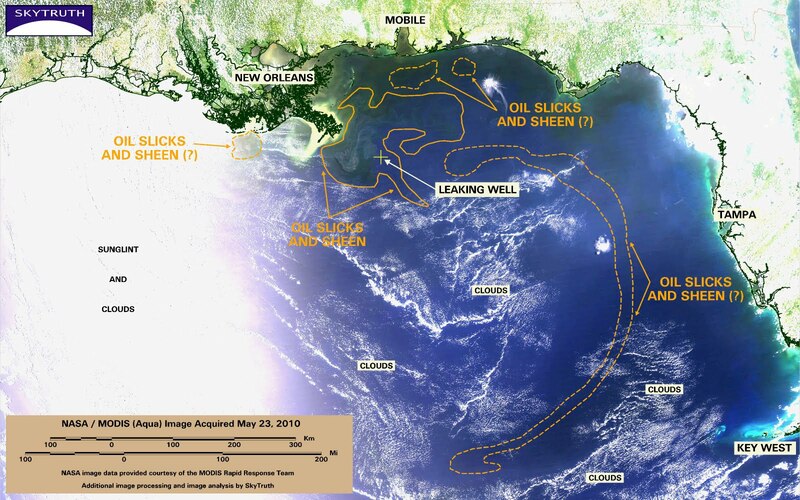 Sure wish they’d send a vessel out there to do some sampling transects. Note the very broad area of sunglint covering the western half of this image. 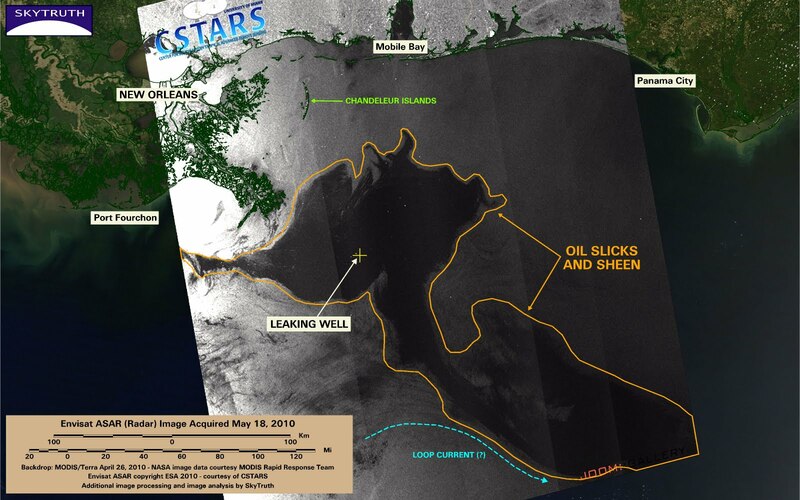 Look closely and you’ll see a cluster of thin, bright, arcuate patches southwest of the Mississippi Delta; these are very thin oil slicks caused by persistent natural oil and gas seeps on the seafloor. I’ve seen a few of these seeps up close and personal from a research submarine, the Johnson Sea-Link II. 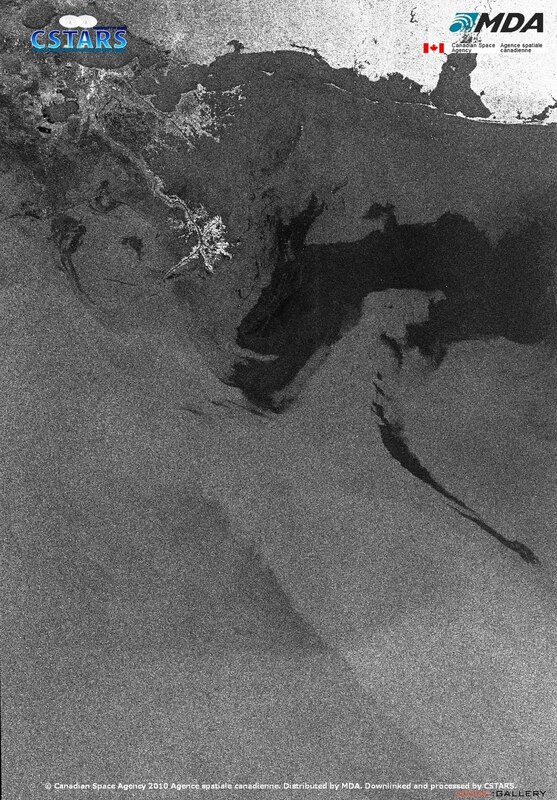 RADARSAT-1 image, May 22, 2010. 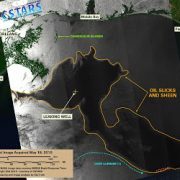 Image courtesy CSTARS. 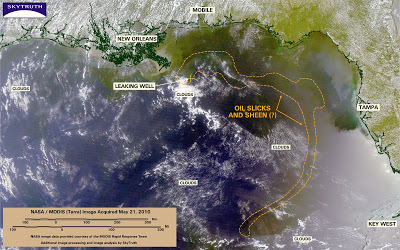 MODIS / Aqua satellite image, May 23, 2010. 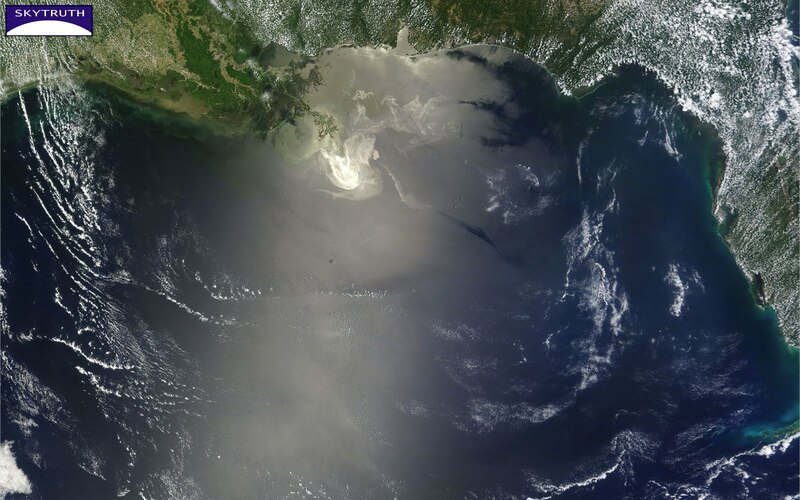 MODIS / Terra satellite image, May 21, 2010. Envisat ASAR image, May 18, 2010. Image courtesy CSTARS. Some of that apparent rapid growth may be due to the fact that radar images are generally a lot better at showing areas of thin sheen than the MODIS imagery. See all of our images related to this incident here. Follow us on Twitter to get all the updates. Please consider helping us out so we can continue our work! © 2016 SkyTruth. A 501(c)(3) non-profit organization. Website: BTS | Eden Design. Hosted by CiviHosting.